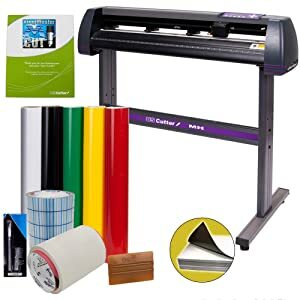 A vinyl cutter is a machine similar to a large printer or plotter, only that it consists of a sharp blade that will precisely cut patterns out of transfer vinyl sheets rather than printing on the sheet using ink. With a vinyl cutter, you can cut out any type of design or image you desire, just like printing. Vinyl cutters are necessary tools if you are planning to set up a printing business. This device can also be very useful in making t-shirts and other types of design work. The design or lettering on the vinyl transfer that has been cut out with the cutter is later heat printed on the substrate by using a heat press. This is a must have tool if you are going to use heat transfer vinyl for heat printing. Choosing your vinyl cutter is an important decision if you are seriously in the business. A professional quality device can turn your dreams into realities. However, a bad selection can lead to failure and frustration. As these tools are quite expensive, and you’ll be investing a high amount of money on your device, a bad choice can result in a big loss. Vinyl cutters come in numerous shapes and sizes with many different functions. For beginners, it might be pretty difficult to choose the right unit among hundreds of options. There are certain factors that you must consider while buying a vinyl cutter. Given below are some of those. Choose a vinyl cutter considering the types of materials that you are going to cut with the tool. If you’ll cut only vinyl sheets with your device, then a lesser expensive unit will generally work well. However, if you want to cleanly cut other types of materials, such as thick plastics, foil, and fabrics, you might need a higher-end model. Quality models will deliver you precise control over the pressure of the blade and location, resulting in clean and most accurate cuts in any material you desire. A flatbed-style vinyl cutter can usually cut thick materials and fabrics more effectively than roll-fed units. Also, if you’ll need to often cut different materials, make sure that your vinyl cutter has easily adjustable blade force. The drive motor is the powerhouse of a vinyl cutter. The grit roller is powered by the drive motor in the unit, which advances and retracts the medium and makes the blade move across the platen. Generally, vinyl cutters come with either of the two types of drive motors; mechanical stepper motor or Digital servo motor. A mechanical stepper motor is driven by physical gears and advances in small steps. It’s an old technology and economically more efficient. A vinyl cutter with stepper drive is a good option for beginners. However, this type of machine makes a lot of noise and can’t plot and cut images smaller than half-inch proficiently. The units with this type of motor have a digital encoder that interprets the commands into zeros and ones, offering a smooth and precise movement of the motor and the blade. The vinyl cutters with digital motor operate without making any noise and offer precise cutting even for cuts as small as 1/8 inch. These models are more expensive than the mechanical models. The faster the speed of the vinyl cutter, the better the unit is. If you have to make many cuts in a day for huge production, then you must choose a model that can cut the vinyl very fast. Speed is usually measured in the number centimeters cut per second. If speed is your priority, go for the vinyl cutter with good frequency. The blade force pressure of a vinyl cutter is an adjustable factor. It’s usually rated in grams of force like 35gm to 250gm. The pressure of the blade has to be adjusted according to the type and thickness of the medium that you are cutting. If you are going to cut materials of different thickness, it’s a good idea to pick a unit with a wider range of blade force pressure. The size of the vinyl cutter is one of the most crucial aspects. Vinyl cutters vary widely in size. You must determine the size of your vinyl cutter based on the size of vinyl sheets that you’ll be using. If you are likely to cut smaller images mostly, then a smaller unit will be adequate. However, If you’ll have to cut larger sheets, spending some extra bucks for a larger vinyl cutter is a better option. Keep in mind that vinyl is often available in rolls which are 15 inches wide or more. Some common sizes are 15, 19 and 20 inches. If you purchase a machine smaller than this, you’ll have to manually trim the extra width from the vinyl sheet before using it, resulting in wastage of both material and time. Tracking function is the ability to align materials accurately with the vinyl cutter. Some cutters have advanced tracking capabilities, which not only saves a prominent amount of time in loading and adjusting of the media and also reduces scrap. Always choose a unit with good tracking ability. Evaluate the ease of operation of the vinyl cutter. Different units have different functionality and operation. First, you must ask yourself how skilled will be the operator of the machine. If you are an experienced user and will be the only one operating the unit, buying a more complicated and less user-friendly model won’t affect the efficiency. However, if you are a beginner then purchase a device with a user-friendly interface. The software is another aspect that varies widely according to the type of model. I would recommend for a software that is easy to use and access. Some units come with their own software and packages, while with others; the software needs to be purchased separately. A larger amount of memory allows the vinyl cutting machine to download files or images more quickly from the computer, allowing you to quickly make multiple cuts. So look for the models with as much memory as possible. While you are going for the buy it’s important that you have a fixed budget in your mind. I know your budget limit, you can look for the models that fall under your affordability. This will not only save your time but also help you choose the best one. Good vinyl cutters are available in the range of $100 to $500. If you can invest a higher amount, you can go for the most expensive ones. However, if your budget limit is low, look for the best machine available in your budget range. This function allows you to optimize the amount of pressure applied to the media. Optimizing pressure improves tracking on thicker materials such as sandblast stencil and PVC. This feature will allow you to begin each job with a clean and straight edge, ultimately reducing material waste. It also minimizes the risk of damage to the platen that could be caused to your plotter when you take a blade to its front. This function can save a huge amount of time. A vinyl cutter with an optic eye can produce registration points that will create a contour line surrounding the shape, which will then precisely and quickly cut around any design. A good unit is always backed by a good warranty policy. Most manufacturers offer a warranty period of around 6 months to 3 years with their product. This will secure your investment in the specific unit. So always purchase a unit with a reasonable warranty time. Like all technical devices, you may also encounter some issues while operating your vinyl cutter in the near future. Quality brands have their own customer support service to help out their customers with the problems they might face while using the device in the long run. You would want to consider this if you are a beginner. In case you new to operating vinyl cutters, you may want to purchase an extended coverage plan for your machine, if available. Along with your vinyl cutting equipment, you can buy some important accessories. In fact, some vendors supply accessories at a discounted price along with the machine. Here are some of the items that you can purchase. Blade holders for replacement in the long run. Transfer vinyl papers used for plotting the designs and images. Blades and cutting strips as replacement parts. The USCutter MH vinyl cutter is one of the best cutters available at the market today. This unit comes with the latest vinylMaster Cut basic editing software. It includes a complete kit for vinyl cutting, consisting of vinyl transfer rolls, blanks, paper application tape and grid tapes. With this unit, you’ll get excellent software experience and precise cut, comparable to the most expensive models. The combo kit is affordable and most preferred by buyers. You can purchase vinyl cutters from online vendors and some local office supply stores. Choosing the right machine is very important as the quality of your project will be completely depending on the cut of the vinyl transfer. If you consider the factors mentioned above, you’ll get a proficient idea of what you really need.